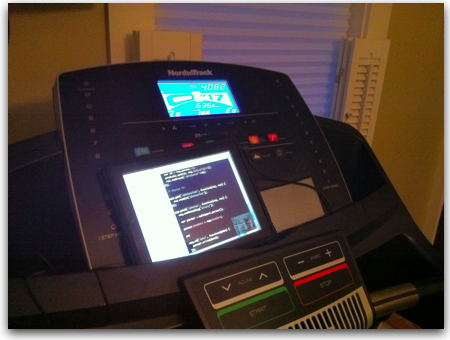 As you can see, I just place the iPad in the tray of the treadmill and then have a 1/8″ audio cable going from the iPad audio output to the audio jack on the treadmill which then sends the audio out the treadmill’s speakers. It’s an okay setup, although the iPad screen is off-center and down a bit. You don’t see it in a picture, but we have a 27″ flat panel TV to the left of the treadmill. I may at some point get the VGA connector for my iPad which would let me then output the video to that TV and gain the use of its speakers as well as the larger screen. But so far it’s working well. The treadmill is a new NordicTrack c900 for those wondering. This entry was posted in Node.js and tagged Node.js on January 18, 2011 by Dan York. This server has received 5727008 hits from both ipv4 and ipv6.